What better way to launch a complete new web store than to do it with a big BOOM? We’re happy to to finally be able to give you guys a complete new mobile friendly website with a new merchandise shop. During all of November we’re giving a 20% discount on ALL orders. 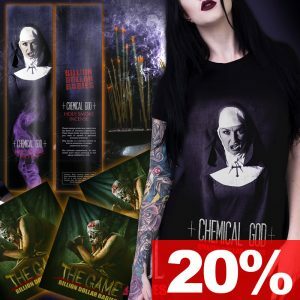 Get ready to get your hands on some cool Incense, CDs, T-shirts and others. In the next months we’re looking in to new designs and exiting products to launch. Please let us know through our Facebook what products you would want to see in the future.